Mike Watkins K9's are trained to go from passive companion to protector. You will have the protection needed and a loyal loving member of the family. You can sleep easy at night knowing your family has a protector. 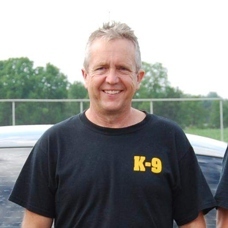 For decades Mike Watkins has been training K9's to fit all our Peace Officer's needs. His Intense Law Enforcement Program has helped develop a program that provides a k9 partner that is reliable to work the streets. Browse our wide selection of trained and certified K9's for use in law enforcement or home protection for the safety of your home, property and loved ones. The success of our company is based on quality products, prompt service, and referrals from satisfied clients. We're committed to our clients. Whether you are military, police, or pet owner our 100% dedication is to you. We are active in our community, loyal to all K9 Teams, and will meet all your K9 needs. Universal K9 is an OPOTA (Ohio Peace Officer Training Academy) Approved Academy. Our trainers work side by side with Police Departments and Sheriffs Offices. We offer training specifically to meet all your needs. There is no "one size fits all" when it comes to training any dog. Our trainers will take the time to evaluate your needs and plan accordingly.